The cost of kerosene is high relative to the income of the poorest. Poor households often spend at least 10% of their income on this power source — as much as $36 billion according to the World Bank. A company called Deciwatt proposed a solution via a prototype device called the GravityLight. Unlike other power sources, the device invented by UK industrial designers Jim Reeves and Martin Riddiford requires no battery, sunlight, or wind. Its energy source is based on fundamental physics — gravity. Seconds is all that’s needed to lift the 12 kg bag which powers the device. As the weight slowly falls, GravityLight can produce 20 minutes of light. Riddiford, now 60, a cofounder of London-based product design firm Therefore and now a cofounder of Deciwatt, got the idea six years ago after leaving a meeting with a charity interested in solar tech. “I just sort of had this vision of, well, why can’t you use human power and store it as potential energy rather than in a battery,” he says. Riddiford has a record for innovative devices including the Brinlock Abacus calculator which was the first calculator with number-shaped buttons. He stated that he regrets not having done charitable work overseas in his youth and hopes to make up for it with his light. In 2013, Deciwatt raised £265,000 on crowdfunding platform Indiegogo to fund the tooling, manufacture and distribution of its first 1,000 lights. More recently, in 2015, Deciwatt won the Shell Springboard program, which supports young entrepreneurs with innovative low-carbon ideas. It received £150,000 to help develop the product further and expand into new markets, beating 150 other applicants to take the prize. 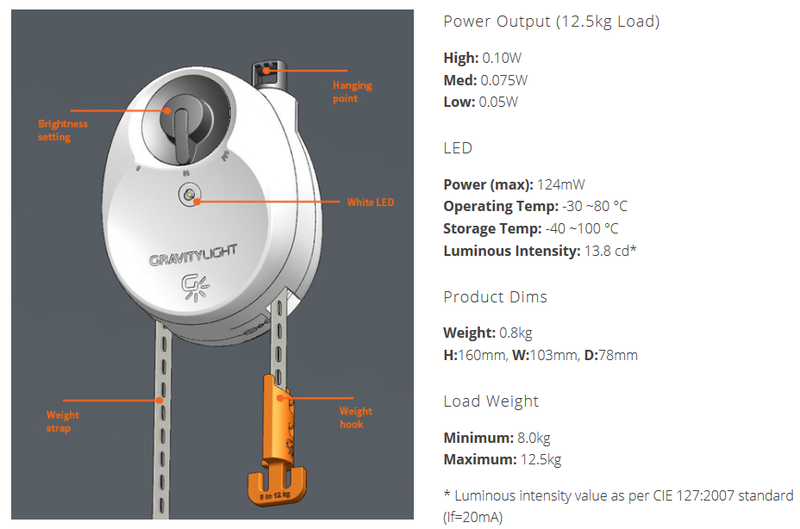 Deciwatt says the GravityLight can cost as low as $10 for the owner. The actual price varies across different markets. The price will reduce in the future as mass manufacturing and the increasing efficiency of LEDs drive the cost down. Even with current prices, the owner can see a return on investment after just three months. GravityLight first version’s specifications (Image: GravityLight). GravityLight converts potential energy into kinetic energy which is then converted into electric energy. A 12 kg weight (a bag filled with rocks or dirt) is lifted to a height of 1.8 meters. On release, it falls very slowly (1 mm / second). The linear movement turns a power sprocket, which converts the linear motion into a slow rotating motion with high torque (rotational force). A polymer geartrain attached turns this input into a high speed low torque output which drives a DC generator. The rotational speed of the DC generator can be thousands of rotations per minute. Though the generator produces only a tenth of a watt, this is enough power to light up an attached LED or ancillary devices. LEDs are highly efficient light sources and today’s small LEDs can produce five times brighter light than a typical kerosene lamp. The light strength can be adjusted to use more or less battery; if you only need ambient lighting, it will keep going for longer. You can also attach radios, cellphones, or other electronic devices. The mechanism can also be used to recharge devices such as batteries. 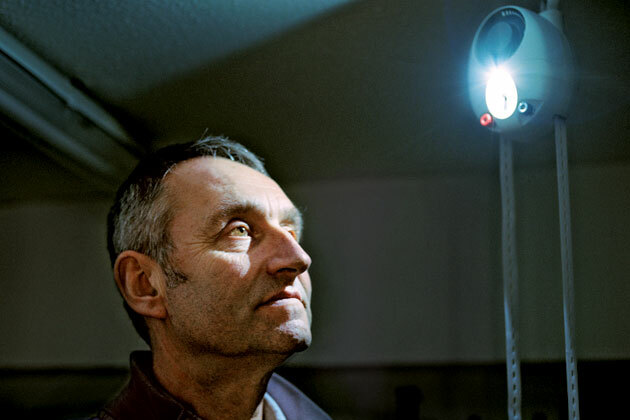 A photo taken by Spencer Murphy of Martin Riddiford and his invention, the GravityLight (Image: Bloomberg Businessweek). The first prototype, a large-scale contraption involving a bicycle wheel and a windup LED flashlight, was refined over four years into its current cheap yet durable plastic version. “It’s technically quite tricky to get it so it doesn’t jam, but we solved that problem through lots of experimentation,” Riddiford says. Today, GravityLight is developing the second generation of gravity lights which will be easier to use, more durable, brighter, and have a longer lifetime. Most importantly, Deciwatt wants to make the device more affordable with a goal of less than $5. Designer Jim Reeves admits that the cost reduction is one of the hardest challenges.